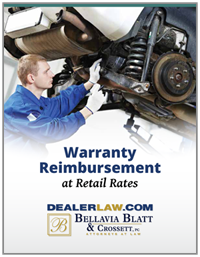 Leonard A. Bellavia will be a speaker at the New Jersey Regional Auto Dealers Seminar on October 16 in Hackensack, NJ. and will discuss The Latest Factory Intrusions: The Right of First Refusal in Buy-Sells. Mr. Bellavia will address the recent proliferation of factory disruptions of the buy-sell process through the rebuffing of buyers in signed buy-sell agreements by the exercise of the right of first refusal (ROFR) in order to exert further control over who enters the dealer network.